We describe here a novel, robust, and efficient tandem affinity purification (TAP) method for the expression, isolation, and characterization of protein complexes from eukaryotic cells. This protocol could be utilized for the biochemical characterization of discrete complexes as well as the identification of novel interactors and post-translational modifications that regulate their function. Ma, Z., Fung, V., D'Orso, I. Tandem Affinity Purification of Protein Complexes from Eukaryotic Cells. J. Vis. Exp. (119), e55236, doi:10.3791/55236 (2017). The purification of active protein-protein and protein-nucleic acid complexes is crucial for the characterization of enzymatic activities and de novo identification of novel subunits and post-translational modifications. Bacterial systems allow for the expression and purification of a wide variety of single polypeptides and protein complexes. However, this system does not enable the purification of protein subunits that contain post-translational modifications (e.g., phosphorylation and acetylation), and the identification of novel regulatory subunits that are only present/expressed in the eukaryotic system. Here, we provide a detailed description of a novel, robust, and efficient tandem affinity purification (TAP) method using STREP- and FLAG-tagged proteins that facilitates the purification of protein complexes with transiently or stably expressed epitope-tagged proteins from eukaryotic cells. This protocol can be applied to characterize protein complex functionality, to discover post-translational modifications on complex subunits, and to identify novel regulatory complex components by mass spectrometry. Notably, this TAP method can be applied to study protein complexes formed by eukaryotic or pathogenic (viral and bacterial) components, thus yielding a wide array of downstream experimental opportunities. We propose that researchers working with protein complexes could utilize this approach in many different ways. Protein-protein interactions (PPIs) are critical for the precise regulation of biological processes1, and further studies on these PPIs can inform about their function2. Several approaches have been devised for the study and characterization of PPIs as well as for the de novo identification of novel regulatory protein components. In 1989, Stanley Fields and colleagues reported the yeast two-hybrid (Y2H) assay3. This approach allows for the unbiased and comprehensive identification of interactors (preys) for a defined protein of interest (bait) in Saccharomyces cerevisiae. In addition to its remarkable utility for discovering PPIs, the Y2H assay can be used for characterizing protein pairs in yeast cells, defining minimal interacting domains, and identifying mutations that abolish such interactions. By modifying the Y2H assay, PPIs can also be studied in mammalian cells4. Variations of the Y2H assay (e.g., yeast three-hybrid system) can also be applied to study protein-RNA and protein-small organic ligand interactions in cells. Another commonly used tool to study PPIs in a homologous system is the co-immunoprecipitation (co-IP) assay5. By using an antibody to immunoprecipitate a protein of interest, the co-IP assay allows researchers to monitor PPIs in cells for various environmental conditions and experimental situations. The use of epitope-tagged proteins (e.g., FLAG, Myc, STREP, and HA, among others) in affinity purification (AP) methods has facilitated the isolation of proteins from complex protein mixtures for several downstream assays, including western blot, silver stain, and enzymatic analysis. However, none of these previous approaches enable the isolation of large quantities of protein complexes for further characterization including in vitro assays, discovery of regulatory subunits by mass spectrometry, and identification of post-translational modifications. An improved version of the AP method is called Tandem AP (TAP), which is a purification technique for studying PPIs by creating a fusion protein with two epitopes that is purified through two subsequent APs6,7. In this article, we present a variation of the TAP method for purifying protein complexes in which two subunits are tagged with different epitopes and then purified through two sequential APs (STREP AP followed by FLAG IP). We first provide a minimalistic overview of TAP (Figure 1) and then a detailed description of all the experimental steps (Figure 2), so that researchers can apply them to their protein complex of interest. To demonstrate the applicability of the TAP method, we chose a well-characterized cyclin-CDK complex (referred to as P-TEFb kinase), which is composed of the regulatory subunit cyclin T1 (CycT1) and a kinase (CDK9), and is involved in the regulation of transcription by RNA polymerase II (Pol II)8,9,10. P-TEFb phosphorylates the C-terminal domain of Pol II and its associated negative elongation factors, which relieves transcriptional pausing at the promoter and thereby facilitates transcription elongation11,12,13. With this known interaction in mind, STREP-tagged CycT1 and FLAG-tagged CDK9 were over expressed in HEK293T cells. 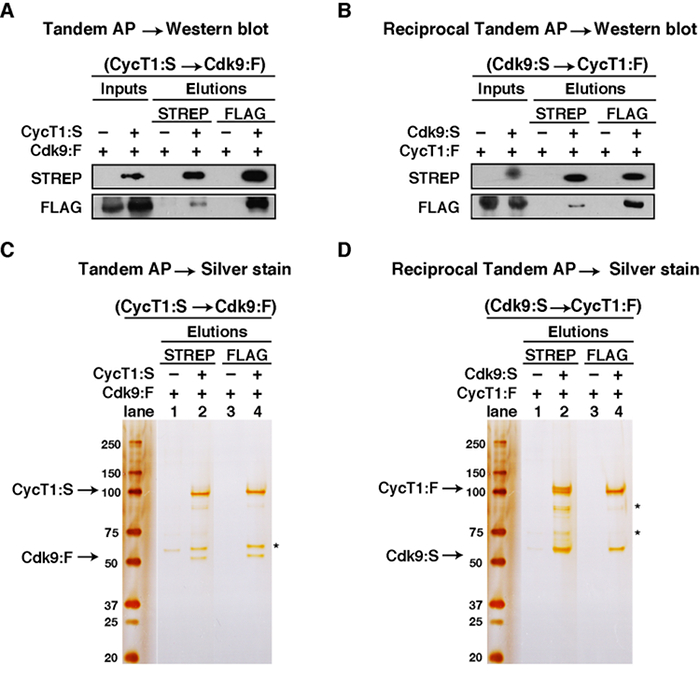 A reciprocal TAP experiment was performed with STREP-tagged CDK9 and FLAG-tagged CycT1 to further validate that the protein interaction is independent of the epitopes utilized. Cells were collected and lysed 48 h post transfection. The soluble lysate was purified by TAP (STREP AP followed by FLAG IP). Input and purified proteins were analyzed by western blot and silver stain (Figure 3). One day prior to transfection, plate 3.5 x 106 HEK293T cells in 10 mL of Dulbecco's Modified Eagle Medium (DMEM) supplemented with 10% (v/v) fetal bovine serum (FBS) and 1% (v/v) penicillin/Streptomycin (10,000 U/ml stock) per 100 mm dish. Plate 3 - 5 100 mm dishes per experiment/condition to ensure sufficient protein recovery. ​NOTE: The number of plates has to be determined for each experiment/condition, which will rely on the expression levels and solubility of the protein complex of interest. Alternatively, if larger scale purification is needed, cell lines can be adapted to grow in suspensions in spinner flasks2, but this method will not work for transient transfections. On the following day, check the cells under the microscope. Cells must be 70 - 80% confluent before proceeding. Transfect the cells with a total mixture of 7 µg of plasmid DNA and 21 µl of transfection reagent per 100 mm dish. Transfect cells with a vector expressing GFP (Table 1) as a control for transfection efficiency. NOTE: If using an HEK293-T-REx or similar stable cell line that induces the expression of two or more complex subunits in response to doxycycline14,15, the inducer will have to be added to the cells and incubated for 48 hr. Similarly, a stable cell line that induces the expression of GFP upon the addition of the inducer would also be required for validation purposes. Proceed to step 2.7. Prepare the transfection mixture per 100 mm dish. In a 1.5 ml microcentrifuge tube, mix 500 µl of unsupplemented DMEM with 7 µg of total plasmid DNA (corresponding to two or more plasmids). In a separate microcentrifuge tube, mix 500 µl of unsupplemented DMEM with 21 µl of the transfection reagent. Repeat for each transfection reaction. Pipette the transfection reagent solution into the plasmid DNA solution (do not mix solutions in the reverse order). Mix by pipetting at least 4 times. Incubate this mixture at room temperature for 10 - 15 min, but no longer than 15 min. Tilt the plate to create a media reservoir and carefully pipette the transfection mixture drop-wise onto the interior side of the plate without disturbing the cells. Return the dish to its original flat position and swirl gently to distribute the mixture. Incubate the cells at 37 °C in a humidified cell culture incubator with 5% CO2 (this condition is hereafter referred to as "tissue culture incubator"). Replace the media 5 hr post-transfection (optional). At 24 hr post-transfection, visualize the cells under a fluorescent microscope to check for transfection efficiency (or induction of control HEK293T-REx stable cell line expressing GFP). Incubate for another 24 hr. At 48 hr post-transfection, remove the media and add 8 ml of cold 1x phosphate-buffered saline (PBS). Pipette up and down to detach cells from the plate. Collect and transfer the cell suspension into a 15 mL tube and spin the cells down at 800 x g for 4 min at 4 °C. Remove the PBS supernatant. Repeat the spin down (800 x g for 1 min at 4 °C) to eliminate any residual PBS. Store the cell pellet at -80 °C for future use or follow the procedure below to continue protein purification. Resuspend the cell pellets using 5× the cell pellet volume (~250 µl per plate) of Passive Lysis Buffer (PLB: 20 mM Tris-HCl pH 7.5, 150 mM NaCl, 1.5 mM MgCl2, 1 mM DTT, protease inhibitor cocktail tablet, 5% v/v glycerol, and 1.0% NP-40) and transfer the cell suspension to a 1.5 ml microcentrifuge tube. Briefly vortex the suspension and nutate for 30 min at 4 °C. Spin down the cell suspension at 10,000 x g for 10 min at 4 °C. Transfer the soluble lysates into a new 1.5 ml microcentrifuge tube and discard the cell pellets. Save 10% of the final volume of the soluble lysate as "STREP AP Input." Store at 4 °C. NOTE: Use STREP beads for the first AP step! Complexes pulled down with STREP beads recover significantly more protein than those pulled down with FLAG beads. Take out (n × 40 µl) + n µl of the 50% STREP bead slurry (n = number of samples) and spin down at 1,500 x g for 2 min at 4 °C. NOTE: Use wide-mouthed tips to pipette beads. Remove the supernatant and add 500 µl of PLB to the beads. Nutate the beads mixture for 5 min at 4 °C. Spin down at 1,500 x g for 2 min at 4 °C. Repeat for a total of 3 washes. Resuspend the beads in PLB to a final volume of n × 40 µl. Add 40 µl of 50% STREP bead slurry to each cell lysate sample and nutate for 2 hr at 4 °C. Spin down solution at 1,500 x g for 2 min at 4 ˚C. Remove the supernatant and store as "STREP AP Flow-through (FT)" at 4 °C. Add 500 µl of STREP AP Wash Buffer I (20 mM Tris-HCl pH 7.5, 250 mM NaCl, 1.5 mM MgCl2, 1 mM DTT, 5% glycerol and 0.2% NP-40) to the beads. Nutate the beads mixture for 5 min at 4 °C and centrifuge at 1,500 x g for 2 min at 4 °C. Discard the supernatant. Repeat for a total of 4 washes. ​NOTE: Before the fourth wash, transfer the beads solution to a new 1.5 ml microcentrifuge tube to reduce the protein background. This step is essential. Add 500 µl Wash Buffer II (100 mM Tris-HCl pH 8.0, 150 mM NaCl, and 1 mM EDTA) and equilibrate the beads by inverting the tubes. Spin down at 1,500 x g for 2 min at 4 °C and discard the supernatant. Elute the protein of interest with 50 µl of STREP Elution Buffer (100 mM Tris-HCl pH 8.0, 150 mM NaCl, 1 mM EDTA, and 2.5 mM Desthiobiotin). Vortex at 800 rpm for 15 min at 4 °C. Spin down the beads at 1,500 x g for 1 min at 4 °C. Collect the supernatant. This fraction corresponds to the "STREP AP Elution" sample. Save the beads fraction at 4 °C for a second elution, which could yield up to half of the amount of protein obtained with the first elution. Aliquot 10% of the STREP AP Elution for silver staining and/or western blotting16. Take out (n x 16 µl) + n µl of FLAG beads solution (n = number of samples) and spin down at 1,500 x g for 2 min at 4 °C. ​NOTE: Use wide-mouthed tips to pipette beads. Remove the supernatant and add 500 µL of FLAG wash buffer (100 mM Tris-HCl pH 8.0, 150 mM NaCl, 1 mM EDTA, and 0.1% NP-40) to the beads. Spin down at 1,500 x g for 2 min at 4 °C. Repeat for a total of 3 washes. Resuspend the beads in FLAG wash buffer to a final volume of n x 16 µl. Add 16 µl of the FLAG bead slurry to the remaining STREP AP elution and nutate overnight at 4 °C. Spin down the FLAG beads suspension at 1,500 x g for 2 min at 4 °C. Save the supernatant and store as the "FLAG IP Flow-through" (FT) at 4 °C. Add 500 µl of FLAG wash buffer to the solution. Nutate for 5 min at 4 °C and centrifuge at 1,500 x g for 2 min at 4 °C. Repeat for a total of 4 washes and remove the supernatant after each wash. NOTE: Before the fourth wash, transfer the protein-beads solution to a new 1.5 ml microcentrifuge tube to reduce background. This step is essential. Remove the supernatant from the final spin and add 30 µL of FLAG wash buffer containing 200 ng/µl of FLAG peptide into the beads. Vortex at 800 rpm for 2 hr at 4 °C. Spin down the suspension at 1,500 x g for 2 min at 4 °C. Harvest the supernatant and store at 4 °C as the "FLAG IP Elution." NOTE: The elution samples can be confirmed by silver stain and/or western blot using standard protocols16, and are ready for further protein assays. When setting up a western blot, run all of the following samples: (1) STREP AP Input, (2) STREP AP FT, (3) STREP AP Elution, (4) FLAG IP FT, and (5) FLAG IP Elution. Volumes loaded will have to be determined for each experiment. All collected samples and beads can be stored at 4 °C for short-term storage and at -80 °C for long-term storage. TAP samples could be analyzed by mass spectrometry to verify the identity of their components, to identify novel post-translational modifications (PTMs), and/or to discover any novel protein interaction with the purified complex2,17. For this purpose, after running a coomassie gel or silver stain, bands can be excised from the gel using a clean scalpel. Several excellent reviews that discuss mass spectrometry methods were previously published18,19. In this article, we demonstrate the applicability of the TAP method to the well-characterized CycT1-CDK9 complex (also known as P-TEFb kinase). Plasmids encoding Cyclin T1-STREP (CycT1:S) and CDK9-FLAG (CDK9:F), or CDK9-STREP (CDK9:S) and Cyclin T1-FLAG (CycT1:F) (Table 1), were transfected into HEK293T cells. Negative controls included transfections with an empty vector and the CDK9:F or CycT1:F plasmids (Figures 3A and B, respectively). The proteins were expressed for 48 hr before the cells were collected. Multiple plates of cells were used per experiment (five plates per sample were used for the data presented in Figure 3) to increase protein production and recovery. After the cells were lysed in individual microcentrifuge tubes, the cell lysates of the same sample were combined into one microcentrifuge tube prior to adding the STREP beads. Combining the protein samples with one portion of beads increases the final protein concentration, which can improve protein recovery from proteins that are difficult to express. Following the initial elution, a second elution can be done in order to increase the total protein input for the FLAG IP. It is important to save the input for each purification step before adding the beads for future troubleshooting (Table 2), if needed. The data in Figure 3A shows the results of the TAP method for CycT1:S and CDK9:F, analyzed by western blot. CDK9:F co-eluted with CycT1:S from the STREP beads, but not in the negative control AP lacking CycT1:S, indicating that CDK9:F and CycT1:S form a protein-protein complex. Expectedly, both proteins were detected in the FLAG elution, which further confirmed the complex formation. Figure 3B shows the results of the reciprocal TAP method, where the epitope tags of the two proteins were swapped (CDK9:S and CycT1:F), and analyzed by western blot. Figures 3C and 3D show the results of the TAP and reciprocal TAP analyzed by silver staining, respectively. Figure 3C lane 2 showed that CDK9:F co-eluted with CycT1:S off of the STREP beads, but not from the control AP (lane 1), thus indicating that CDK9:F and CycT1:S formed a protein-protein complex. In the subsequent FLAG elution, as shown in lane 4, CycT1:S co-eluted with CDK9:F off of the FLAG beads. Similarly, Figure 3D showed that CycT1:F co-eluted with CDK9:S off of the STREP beads, but not from the control AP, and that the protein-protein complex was efficiently recovered after the second FLAG IP step. Both the western blots and silver stains confirmed that the TAP protocol worked efficiently for the purification, isolation, and characterization of the protein complex of interest. Figure 1: Overview of TAP Purification Strategy. A simple scheme describing the steps of TAP. Plasmids encoding the protein of interest with either the STREP or FLAG epitope tag are co-transfected into mammalian cells. After 48 h induction, the cells are collected and lysed. Soluble cell lysate containing the protein of interest along with other proteins are loaded onto STREP beads for STREP AP. Proteins that either contain the STREP tag or are bound to the STREP-tagged protein attached to the beads are then eluted. The FLAG beads were then added into the STREP elution. Proteins that either contain the FLAG tag or are bound to the FLAG-tagged protein attached to the beads are then eluted. Elutions could be analyzed by the indicated methods. Please click here to view a larger version of this figure. Figure 2: Schematic Representation of TAP Strategy. A detailed protocol of TAP. See text for details. Please click here to view a larger version of this figure. Figure 3: Example of Step-by-step Analysis of TAP Purification. (A) Western blot analysis of TAP (CycT1:S and CDK9:F). (B) Western blot analysis of reciprocal TAP (CDK9:S and CycT1:F). From 1 ml of whole cell lysate, 5 μl (0.2%) was loaded as "STREP AP Input." 975 μl of the remaining whole cell lysate was added to STREP beads for STREP AP and 100 μl of "STREP AP Elution" was collected. From this, 5 μl (2%) was loaded. 80 μl of the "STREP AP Elution" was added to FLAG beads for FLAG IP and 30 μl of "FLAG IP Elution" was collected. From the 30 μl of "FLAG IP Elution", 7 μl (23.3%) was loaded. (C) Silver stain analysis of TAP (CycT1:S and CDK9:F). 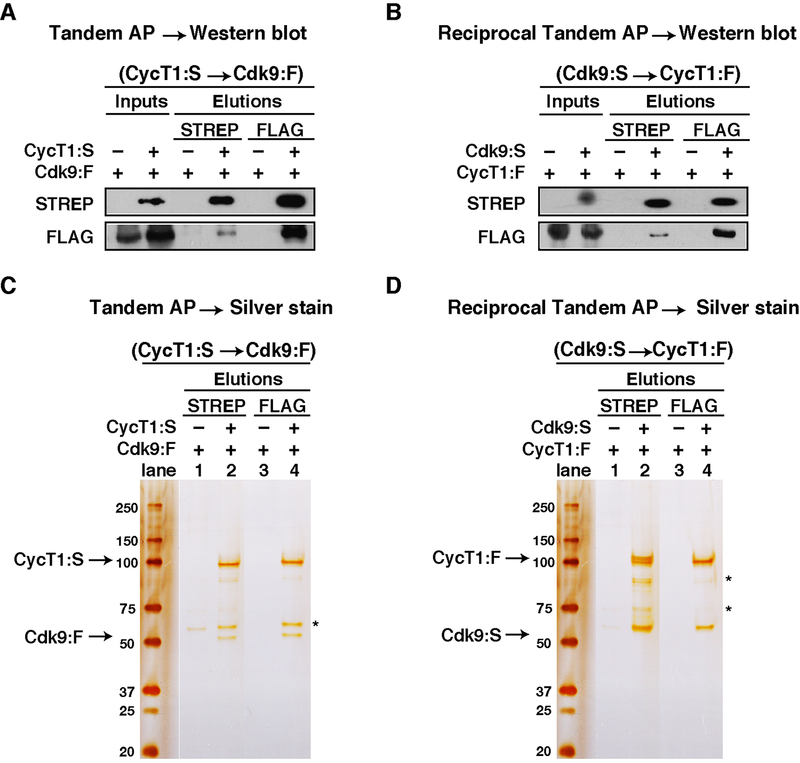 (D) Silver stain analysis of reciprocal TAP (CDK9:S and CycT1:F). 5 μl (2%) of "STREP AP Elution" and 7 μl (23.3%) of "FLAG IP Elution" were loaded. The asterisks indicate co-eluted impurities. Please click here to view a larger version of this figure. Table 1: Plasmids used in this Study. CycT1 and CDK9 were ligated into the pcDNA/4TO-STREP and pcDNA/4TO-FLAG plasmid vectors. These constructs were transformed into DH5α competent cells and plated on LB-Ampicillin plates. Colonies were selected, grown, and screened. Successfully ligated clones were verified by Sanger sequencing and the combination of restriction digestion and agarose gel electrophoresis. For CycT1 we used a shorter version (1 - 708) instead of the full-length (1 - 726) because the last 18 residues contain a PEST sequence (a peptide sequence rich in proline, glutamic acid, serine, and threonine), which acts as a signal peptide for protein degradation20. CDK9 was full-length. The sequence of the tandem STREP tag is as follows: GGGGWSHPQFEKGGGSGGGSGGGSWSHPQFEK. The sequence of the tandem FLAG tag is as follows: GGGGDYKDHDGDYKDHDIDYKDDDDK. Table 2: Troubleshooting Table. Before beginning with troubleshooting, double check to make sure that each essential step has been followed. Certain steps in this protocol require more optimization than others to achieve the expected result. Please click here to download this file. The protocol described here for the expression and isolation of protein complexes from eukaryotic cells is not limited to the biochemical characterization of such molecular assemblies, but can also be utilized for the identification of novel interactors and post-translational modifications that could regulate their function. The utilization of affinity tags is not restricted to what is mentioned in this protocol; but our experience suggests that using STREP as the first AP step significantly enhances the yield of the final protein-protein complex. 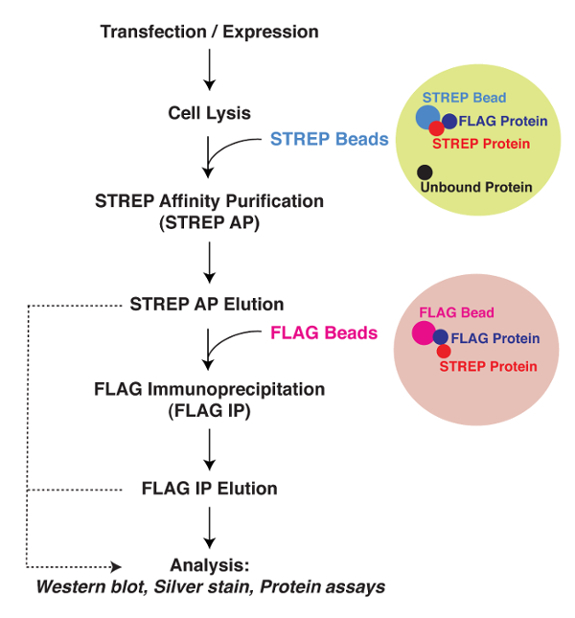 Both the binding and elution steps to and from the STREP beads are extremely efficient compared with other epitope tags (e.g., FLAG). In addition, in theory, TAP could be applied to other proteins or domains with some minor optimizations, such as buffer conditions, number of plates per experiment (for both transient and stable expressing systems), etc. 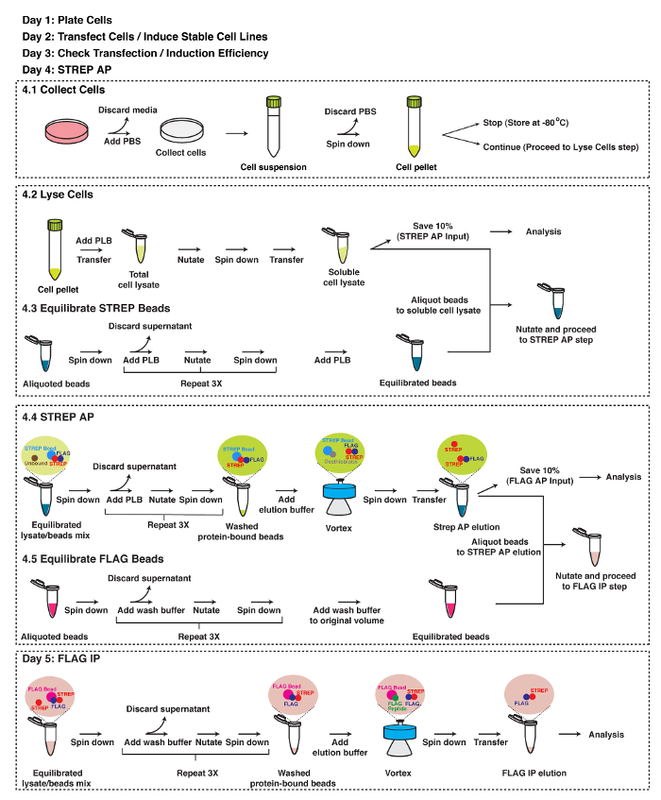 Furthermore, the TAP method can also be applied to other cell lines if specific protein complexes require a special system for their function or their interactions with unique factors. To facilitate troubleshooting, it is highly recommended that the input and FT samples both be saved (Table 2). When the expected protein bands cannot be visualized in the elution, the FT samples can be used to troubleshoot the experiment and determine whether or not the sample had bound to and/or eluted off of the beads. A successful TAP is strictly dependent on high levels of protein expression and recovery. Thus, researchers would have to optimize the amount of starting material on a case-by-case basis. If transient transfection is used to express protein components, the transfection efficiency should be at least 70% before proceeding with the second step of the TAP. The reciprocal TAP method (in which the epitopes are swapped between the two baits) usually helps in determining which experimental strategy should be used to achieve the best purity and yield. Again, this will have to be investigated on a case-by-case basis. Importantly, performing reciprocal TAP also confirms that the PPI is independent of the affinity tag used. Some aspects of the TAP method presented herein have limitations. For example, overexpressing the FLAG- and STREP-tagged proteins could generate artifacts for the ectopically expressed protein itself or their interactors. Different epitope tags may affect protein expression levels, protein conformation, and/or subcellular localization. Besides the cell line and transfection efficiency limitation, the size of the complexes to be purified might be an issue. This TAP method works well for multi-subunit protein complexes. From our experience, four components can be detected by silver stain (data not shown). However, when using two-tagged components, the other interactors may not be co-purified at identical stoichiometric levels. Therefore, for this particular goal, the use of cell lines that induces lower levels of expression of the complex components is advised. Another limitation would be the strength of the PPI. If the interactions are not stable enough, some components could be lost during the purification steps (especially in the final FLAG IP step). The TAP method was previously described and several different epitope tags were tested, validated, and compared6. However, the TAP method presented in this article is novel and provides an easy, efficient, robust, and alternative strategy to study PPIs, complex assembly, and infer protein network composition and function. Compared with previous TAP methods, this STREP-FLAG TAP strategy allows for the rapid purification of complexes for further characterization without prior knowledge of the complex composition, activity, or function; and without the need of protease cleavage (e.g., TEV) for protein elution (which can significantly decrease protein yield). Because of the increased protein complex recovery, the STREP-FLAG TAP method also allows for the robust identification of proteins that associate with the protein complex of interest in cells through tandem mass spectrometry analysis10,15. Subsequently, other methods, like confocal microscopy, size exclusion chromatography, and co-IP assays, can also be utilized to validate the PPIs. Finally, we propose that an alternative version of the TAP protocol could be adapted to purify and study the assembly of discrete protein-RNA complexes, which will tremendously help researchers in the field of RNA biology. In summary, we present a method to purify and characterize PPIs in mammalian cell lines. We propose that this method lays the foundation for the future characterization and functional analysis of many novel protein complexes. Research reported in this publication was supported by the National Institute of Allergy and Infectious Diseases (NIAID) of the NIH under award number R01AI114362 and Welch Foundation grant I-1782 to Iván D'Orso. Sharan, R., Ulitsky, I., Shamir, R. Network-based prediction of protein function. Mol Syst Biol. 3, 88-99 (2007). Jager, S., et al. Global landscape of HIV-human protein complexes. Nature. 481, 365-370 (2012). Fields, S., Song, O. A novel genetic system to detect protein-protein interactions. Nature. 340, 245-246 (1989). Luo, Y., Batalao, A., Zhou, H., Zhu, L. Mammalian two-hybrid system: a complementary approach to the yeast two-hybrid system. Biotechniques. 22, 350-352 (1997). Lee, C. Coimmunoprecipitation assay. Methods Mol Biol. 362, 401-406 (2007). Puig, O., et al. The tandem affinity purification (TAP) method: a general procedure of protein complex purification. Methods. 24, 218-229 (2001). Jager, S., et al. Purification and characterization of HIV-human protein complexes. Methods. 53, 13-19 (2011). Price, D. H. P-TEFb, a cyclin-dependent kinase controlling elongation by RNA polymerase II. Mol Cell Biol. 20, 2629-2634 (2000). Peterlin, B. M., Price, D. H. Controlling the elongation phase of transcription with P-TEFb. Mol Cell. 23, 297-305 (2006). McNamara, R. P., McCann, J. L., Gudipaty, S. A., D'Orso, I. Transcription factors mediate the enzymatic disassembly of promoter-bound 7SK snRNP to locally recruit P-TEFb for transcription elongation. Cell Rep. 5, 1256-1268 (2013). Adelman, K., Lis, J. T. Promoter-proximal pausing of RNA polymerase II: emerging roles in metazoans. Nat Rev Genet. 13, 720-731 (2012). D'Orso, I. 7SKiing on chromatin: move globally, act locally. RNA Biol. 13, 545-553 (2016). McNamara, R. P., Bacon, C. W., D'Orso, I. Transcription Elongation Control by the 7SK snRNP Complex: Releasing the Pause. Cell Cycle. 15, 2115-2123 (2016). Yao, F., Svensjo, T., Winkler, T., Lu, M., Eriksson, C., Eriksson, E. Tetracycline repressor, tetR, rather than the tetR-mammalian cell transcription factor fusion derivatives, regulates inducible gene expression in mammalian cells. Hum Gene Ther. 9, 1939-1950 (1998). McNamara, R. P., et al. KAP1 Recruitment of the 7SK snRNP Complex to Promoters Enables Transcription Elongation by RNA Polymerase II. Mol Cell. 61, 39-53 (2016). Ausubel, F. M., et al. Current Protocols in Molecular Biology. Greene Publishing Associates and Wiley-Interscience. New York. (1994). Trudgian, D. C., et al. Comparative evaluation of label-free SINQ normalized spectral index quantitation in the central proteomics facilities pipeline. Proteomics. 11, 2790-2797 (2011). Choudhary, C., Mann, M. Decoding signalling networks by mass spectrometry-based proteomics. Nat Rev Mol Cell Biol. 11, 427-439 (2010). Bensimon, A., Heck, A. J., Aebersold, R. Mass spectrometry-based proteomics and network biology. Annu Rev Biochem. 81, 379-405 (2012). Rogers, S., Wells, R., Rechsteiner, M. Amino acid sequences common to rapidly degraded proteins: the PEST hypothesis. Science. 234, 364-368 (1986).